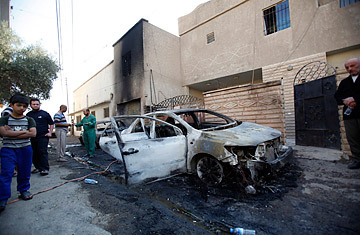 Residents gather around a damaged vehicle after a bomb attack in Baghdad, Nov., 10th, 2010. The Blast killed two Christians and wounded four. Could the Baghdad Carnage End Iraq's Impasse? A series of deadly attacks on Iraq's Christians has left the religious community, one with ancient roots in Mesopotamia, feeling vulnerable and reeling with fear. One expatriate cleric has even called for the remaining Christians of what is called the Assyrian Catholic Church to abandon Iraq. But Yonadam Kanna isn't going anywhere. "These attacks express the contempt and hatred of terrorist organizations for Christians," says Kanna, one of less than a dozen Christians in the 325-member Iraqi parliament, "but we will remain whatever they do. Iraq is our country and we won't leave." There has been no let-up, however, in the campaign against his religion. On Wednesday, synchronized bombings struck at least 11 Christian locations across in Baghdad, killing at least six people and wounding more than 30. The strikes appear to be directly connected to a vicious October 31 church invasion that left at least 50 people dead after gunmen overran Sunday services, shooting down the attending priest and acolyte at the altar before spraying automatic gunfire on the congregation and detonating explosives vest. The Halloween murders at Our Lady of Salvation in Baghdad's middle class, mixed Karada neighborhood were followed by an announcement by the Islamic State of Iraq, an al-Qaeda proxy, promising "We will open upon [the Christians] the doors of destruction and rivers of blood." Even so, Kanna and other like him are digging in with almost biblical resolve  and receiving support from unlikely places inside their own divided country. On the street, suspicions abound among Muslims as to why the Christian minority has been so heavily targeted. After all, amid Iraq's complex sectarian equation that pits Sunni versus Shi'a versus Kurd, the Christians, numbering some 400,000, are essentially non-players. Sayed Hassan al-Husaayni, the imam at the mosque closest to the Salvation church, says he and his followers have no time for hate-mongering. "We condemn the attacks that have struck the Christians. They are our brothers and we have been living with them for centuries. I believe they are the victims of a terrorist organization, but I'm positive that Iraqi Muslims respect their brothers. We just worry that Christian will leave Iraq and then the Western world will have a negative opinion of Muslims in Iraq." Christians are generally better-educated than the general population and tend to belong to the professional classes. A mass exodus would only further debilitate Iraq's development. "The motive is simple, to rally Muslims against the West," says says Dr Alla Allawi, an independent political analyst and Al-Qaeda expert who teaches political science at Wasit University in extremely conservative Shi'a southeastern Iraq. "Al-Qaeda is trying to fulfill its dream of making Iraq a country with just one religion  Islam  like Afghanistan. I believe other countries are supporting this cause. They want to 'clean' the country of Christians, especially as [the U.S. military] leaves." Imam Husaayni says there is another culprit: a bickering political class that has left the country without a working government for more than eight months since inconclusive national elections in March. Although the government is set to meet on Thursday for the first time in months, many see the so-called political and security vacuum as a catalyst for more terrorist strikes. Even as the Vatican, England, France and the United Nations have condemned the killings and several countries have offered refuge, Christians like Kanna are adamant about staying. "There is clearly a plan to intimidate all the Christians into leaving their homes and fleeing the country where they were born and raised," he says, "but we wont' just go away. Some must protect their families and go , but some of us have no intention but to stay no matter what [the terrorists] decide to do. We have friends here as well." Indeed, Iraq's Muslims have responded with sympathy and support. Sheikh Salim Al-Dayawie, head of the Al-Dayawie tribe in the southern province of Maysan, said any prospect of poisoning Iraqis Muslims against Christians is misguided. "We have some Christian families and churches in Maysan and we would work hard to protect them. We have lived in with them in harmony for thousands years and we have nice friendships. We visit them, they visit us, and of course we won't let to any extremists to attack them or push them out Iraq." And he is willing to support them with more than words. "We will work with [members of] our tribes in Baghdad to protect the Christians. We are ready to send our sons to protect them."